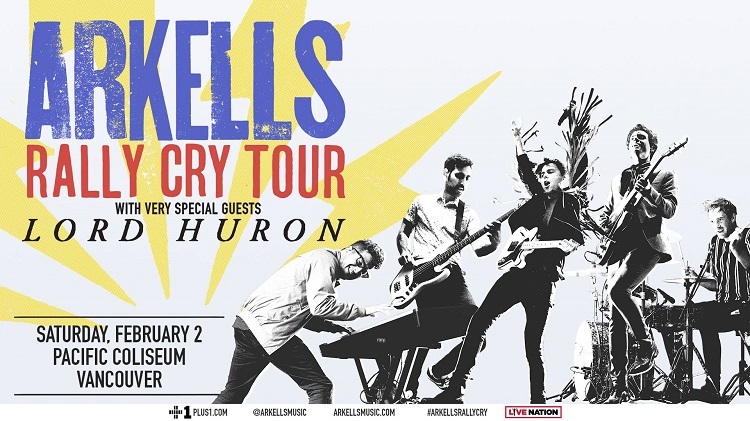 A couple years ago (almost exactly two years ago, in fact), I talked about witnessing the journey Arkells have taken from venues like the Biltmore, all the way up to arena shows, when they played Doug Mitchell. And now this weekend they were back for another headlining arena show, this time at the Pacific Coliseum. The Hamilton band burst onto the stage with "Relentless", an appropriate title for the entire band's energy (and work ethic) but especially singer Max Kerman, who started at a 10 and somehow barely slowed down throughout the night. And the crowd reciprocated, as "Leather Jacket" had the majority of the building singing along while Max sang on the edge of the catwalk that stretched out into the sea of people. In fact, over the course of the show every single member of the band (plus the Northern Soul Horn Section) would strut out to the tip of the stage at one point or another, for a showcase solo -- keyboardist Anthony Carone even broke out the keytar to the band's chagrin -- or the stripped down, full band performance of "Kiss Cam" as they huddled together. Their two hour set focused on the new Rally Cry, but also hit every album, going back to their origins with "Champagne Socialist" seguing into "The Boss Is Coming" and back again, and even deep cuts requested by fans on a hotline they set up. They listened to a recorded message from an audience member (Max on the prop payphone they had onstage) before going into the rarely-played "Agent Zero". Other highlights included huge singalongs to powerhouse hits like "11:11" and "Knocking At The Door", the darker "Come To Light", and my favourite off the new album, the Motown-infused "Eyes on the Prize". During which Max disappeared off the stage only to reappear among the crowd in the lower bowl, checking in on people around him, making sure they had the day off work tomorrow (and handing out sick notes if they didn't) before making his way back through the crowd and to the stage. The 'main' set wrapped up with "Hand Me Downs" and bursts of confetti, leaving the crowd to sing the "ohh-oo-oohs" for an impressively long time after they left the stage (especially for a crowd that large) before they returned for a couple more. One of my favourite things about seeing Arkells perform is what kind of covers they break out through the set and they absolutely didn't disappoint with the first song of the encore, "Dancing Queen", before capping off the night with the promise "My Heart's Always Yours". I'm not gonna lie, I absolutely miss being able to see Arkells in smaller venues, even a Commodore-sized room. But watching them onstage at the Coliseum, it was undeniable that they belong there, and put on an as incredible a show as they always have. Check out more of Christine’s snaps here! Champagne Socialist / Oh, The Boss Is Coming!